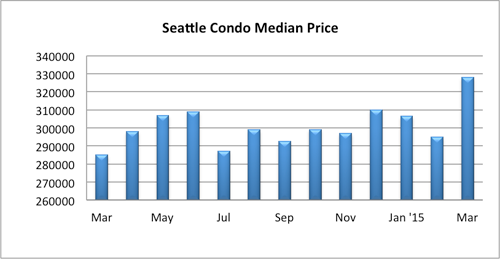 As we would anticipate with the spring selling cycle, Seattle’s hot condo market was on fire with double-digit increases in sales volume and condo prices. The citywide condo median sales price rose to $328,000 reflecting an 11.2% one-month and 15.1% year-over-year (YOY) gain in value. That’s the highest citywide median sales price since January 2009. Most neighborhoods reflected appreciation with the exception of NE and West Seattle, which saw modest dips of 3.8% and 6.1% YOY, respectively. On the other hand Queen Anne, Capitol Hill and NW Seattle experienced double-digit improvements (see chart at bottom). 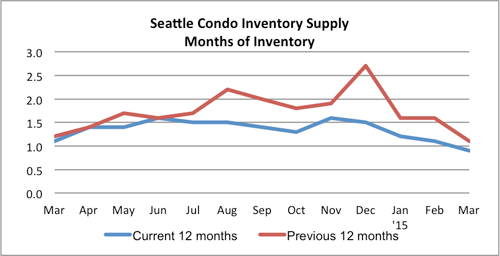 With our continued dearth of Seattle condo listings for sale, combined with robust sales activity, the Seattle condo inventory supply rate fell to 0.9-months of supply. 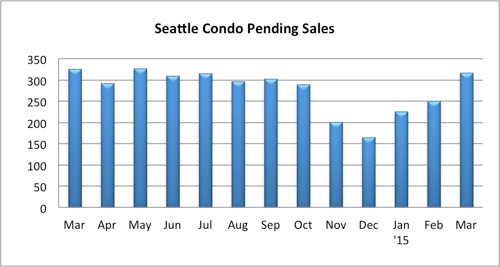 That is, if no new condos come on the market it would take less than 30-days to sell out of inventory. This is the metric utilized to determine market conditions – seller’s market vs. buyer’s market. A rate of less than 3-months of supply is considered a seller’s market. 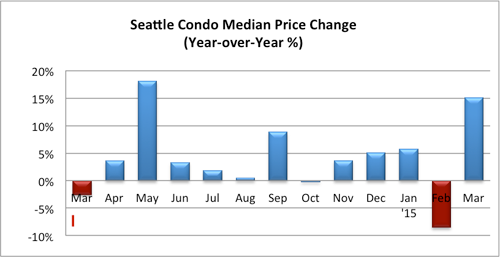 At less than a month of supply the Seattle condo market is tighter than it’s been in over a decade. 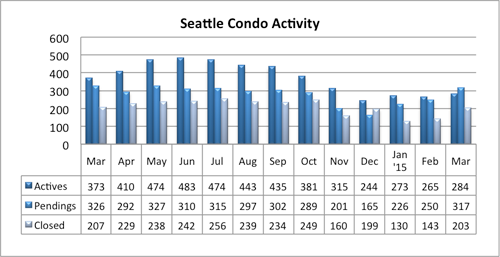 There were 284 condo units for sale in March. While that was 23.8% fewer that last March, at least there was a slight improvement over February by 19 units (or 7.2%). Seattle, however, remains in a solid seller’s market. There were 317 pending transactions last month, so we had more properties under contract than we had units available for sale, exhibiting strong buyer demand for condos. The numbers of pendings reflected a one-month surge of 26.8% over February, but a reduction of 2.8% compared to a year ago. The fact that we had 89 fewer units available for sale this year could account for the YOY drop in sales volume. 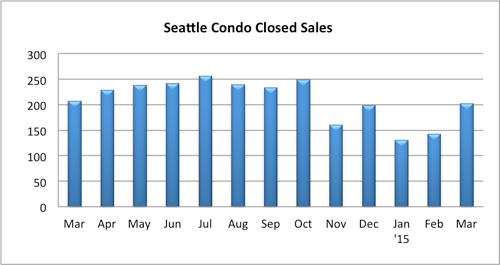 The number of closed Seattle condo sales jumped 42% from February to 203 units, though 1.9% fewer YOY. Unless condo owners contemplate selling their Seattle condos, the current environment buyers are finding themselves in is not likely to improve in the near future. A developer of a major downtown high-rise that we had expected to be condos is being built as apartments instead. Currently, there are only five condo developments under construction in Seattle (3 in Ballard, 1 in Belltown and 1 on First Hill). So, we don’t anticipate much relief from new condo units soon. Multiple offers and escalating bid situations will continue to be the norm in more desirable neighborhoods. Last March, cumulatively, condos sold at 99.7% of the list price. This year, it’s at 100.7% of list. Of course, that’ll vary by neighborhood and price point. The $250,000 to $500,000 range in the metro core (downtown, Belltown, Capitol Hill & Queen Anne) have been the most competitive. If you need assistance navigating through Seattle’s current market place, we can help. Its amazing that the number of sold condos of dropped by almost 24%, yet the price year over the went up by 15%. What would you say caused this trend to happen? For the most part, lack of inventory resulting in multiple bidding wars pushing selling prices up. What are the three Ballard projects? I know of Vik and Salt, which are across the street from each other. What is the third? It’s nuts. I reserved a unit at Vik in June and just found out the same floor plan on the same floor is now for sale at 40k higher. Ugh. The 3rd project is Solo Lofts at 2018 NW 57th, same developer as Salt. They just have one penthouse unit remaining. That’s good for your Vik reservation, it increases the value of your unit.